The Union RR opened this rail line in 1920. It serves the USX Mon Valley Works and General Motors stamping plant in West Mifflin and the USX Clairton Coke Works. 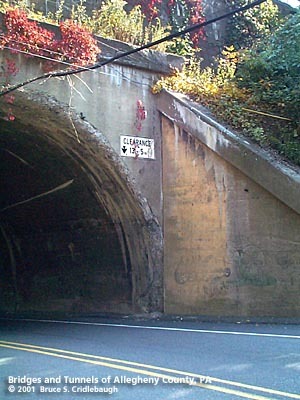 There are three roads which pass through tunnels under the railroad: Lebanon School Rd, Brick Hollow Rd and Curry Hollow Rd. Of these, Lebanon School Rd by far handles the most traffic -- but has the smallest opening: just wide enough for two lanes of traffic and a height restriction of just over 13 feet. 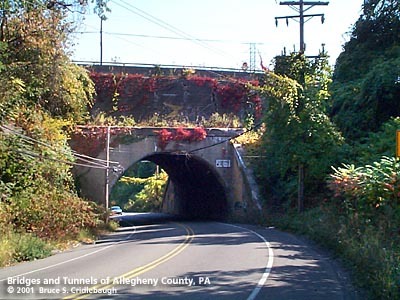 But the other two tunnels feature what may be the largest openings of any tunnels in Allegheny County -- nearly 50 feet wide and over 25 feet high. 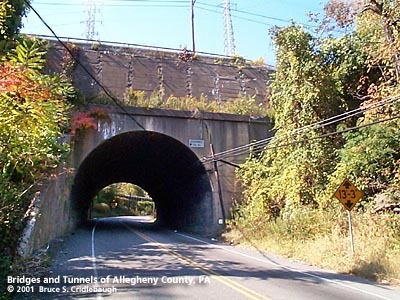 Ironically, the roads which lead to the latter pair are barely paved and are blocked by tiny underpasses below the former Pennsylvania Railroad along the Monongahela River. At Brick Hollow, the underpass opening is only inches larger than a minivan. And Curry Hollow Rd, basically a gravel road, has been closed to traffic due to stream erosion and illegal dumping; all traffic is diverted to Elizabeth St through Dravosburg. A possible explanation for the mismatched dimensions may be found on older maps. J.C. Risher and George Lysle are shown as principal landowners in the area. Each was a coal mining operation and perhaps the underpasses were sized to allow for future rail traffic. But the floor of the Curry Hollow tunnel is good quality brick which seems to suggest a more important road was anticipated to connect Dravosburg to the hilltops near Lebanon Church. Near Monongahela River outlet of Brick Hollow, "Stephen Brick" is noted as the landowner -- indicating the hollow is named for the family not the industry. All three tunnels carry a heavy overburden. Camden Hollow, again, is the smallest and carries the least. The rail line and service road into the Mon Valley Works which cross over are elevated further by concrete cribbing. The Brick Hollow structure passes through an embankment about 90 feet high. At Curry Hollow, the 50+ ft high tunnel burrows through an embankment about 150 ft high and several hundred feet long. The spurs which service the GM and USX plants split off above Curry Hollow, resulting in the 429 ft tunnel below.